With so much conflicting diet and nutrition advice available, it can be difficult to discern fact from fiction, particularly when it comes to carbs. A healthy diet begins with the basics of how macronutrients — carbohydrates, protein and fat — contribute to the calories you consume. There are 4 calories per gram of carbohydrate, 4 calories per gram of protein and 9 calories per gram of fat, according to the USDA National Agricultural Library. Each gram of carbohydrate contributes 4 calories of energy. Carbohydrates are compounds made up of carbon, hydrogen and oxygen. 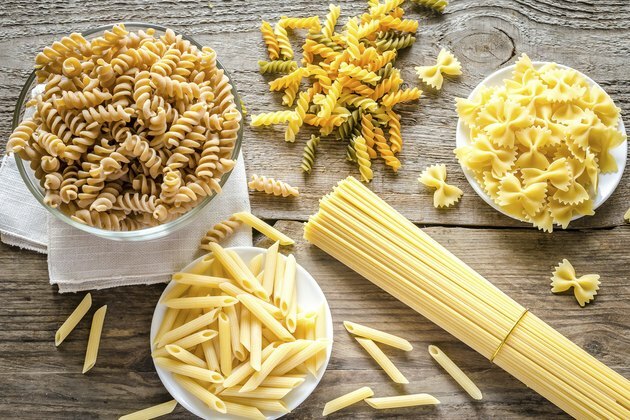 Carbs are categorized as simple or complex, depending on their chemical structure. Simple carbs come in the form of sugars, while complex carbs include starch and fiber. Most carbohydrates you consume are broken down into glucose, which the body uses for energy. Glucose that is not immediately used by the cells is stored as backup energy in the form of glycogen in the liver and muscles. However, once this storage is full, excess glucose is converted to fat. Read more: How Is Excess Glucose Stored? According to the Food and Drug Administration, the daily value for carbohydrates is 300 grams for a person consuming a 2,000-calorie-per-day diet. However, individual caloric needs vary based on age, body composition and activity level. Carbohydrates are abundant in plant-based foods, such as fruits, vegetables, grains and various types of beans. Dairy foods contain sugar in the form of lactose. Processed snack foods and sweets are often very high in carbohydrates in the form of added sugars. Although pure alcohol is not a carbohydrate, many alcoholic beverages also contain carbohydrates. Although all carbs contain 4 calories per gram, they are not all created equal. According to the Dietary Guidelines for Americans 2015-2020, a healthy eating pattern focuses on nutrient-dense foods. In the carb department, nutrient-dense foods include veggies, fruits, beans, peas and whole grains. These foods typically contain fiber and other important vitamins and minerals as well. Consuming food as close to its natural form as possible will also help you avoid eating a lot of added sugars. The Dietary Guidelines for Americans 2015-2020 states that less than 10 percent of your daily calories should come from added sugars. According to the Centers for Disease Control and Prevention, normal fasting blood sugar levels should be 99 milligrams per deciliter (mg/dL) or lower. The glycemic index represents how quickly different types of food raise blood sugar levels. Foods that have a high glycemic index, such as processed carbohydrates, white potatoes and bananas, cause a sharp rise and then a decrease in blood sugar levels. Eating foods with a lower glycemic index, such as whole grains, apples, sweet potatoes and beans, helps you maintain steady blood sugar levels. Prioritizing these foods in your diet on a regular basis can help lower the risk of developing diabetes, heart disease and some cancers. Consuming carbohydrates with foods that contain fat also helps slow absorption of the carbs, reducing the negative impact on blood sugar levels. USDA National Agricultural Library: How Many Calories Are in One Gram of Fat, Carbohydrate, or Protein? What Food Groups Are Carbohydrates Found in? How Is Glycogen Used During Exercise?